Sarto Rocheleau - OUT OF STOCK CobraHalibrand type Spinners﻿ Sold out Email me to get on a list to be notified when available ﻿ If your Halibrand spinner looks like this one, the tool will fit.This tool applies equal force to all 3 ears of the spinner without distorting the spinner. The tool drops onto the spinner and is protected with leather from metal to metal contact. For that vintage look, I used Old English Saddle Leather, tanned the old fashion way for durability and toughness.﻿ The leather can take the torque and is easily replaced. Pictured is the older versionThe tool's center piece drops into the hub and helps to center the tool on the spinner. The center piece can be unbolted and removed without any loss of function. If the tool's center piece does not fit inside of the hub, its because 2% of the hubs manufactured are thicker. This is the same with the Lotus 26R spinners. The tool's design will self-center itself when torque is applied. ﻿ By adding an extension to the socket, the tool can reach into the deepest of wheels where a hammer should not go.If the hub threads protrudes more than 5/8 of an inch past a fully tighten hollow Halibrand spinner, It pushes the tool off its power portion and will bend the tips and will not work. on that wheel. Two reasons for this to occur, the hubs are manufactured longer or the wheels are made thinner. Only about 2% of the wheels or hubs cause the tool not to fit properly. Before ordering measure the hub for a 5/8 maximum measurement past a fully tighten spinner. You will need to remove the dust cap from the hub to use the tool unless it does not measure more than 5/8 inch. The center part of the tool can be unbolted and removed without any loss of function but does aid in attaching/stabling the tool to the spinner. Lotus 26R Elanswith hollow three eared spinners can use the Cobra knockoff tool Sold out Email me to get on a list to be notified when available ﻿ If the ID of the hub is too thick to insert the metal center piece of the knockoff tool, the center piece of the tool can be removed and is still fully functional. See the Cobra information above. OUT OF STOCK Ford GT 40 with Halibrand type spinners With a torque wrench you'll know that the wheels are on with the proper tightness and safely secured without beating on them with a hammer. There is a tendency to over tighten the spinners, making it very hard to remove. This tool engages all three of the spinner's ears evenly with the same force. 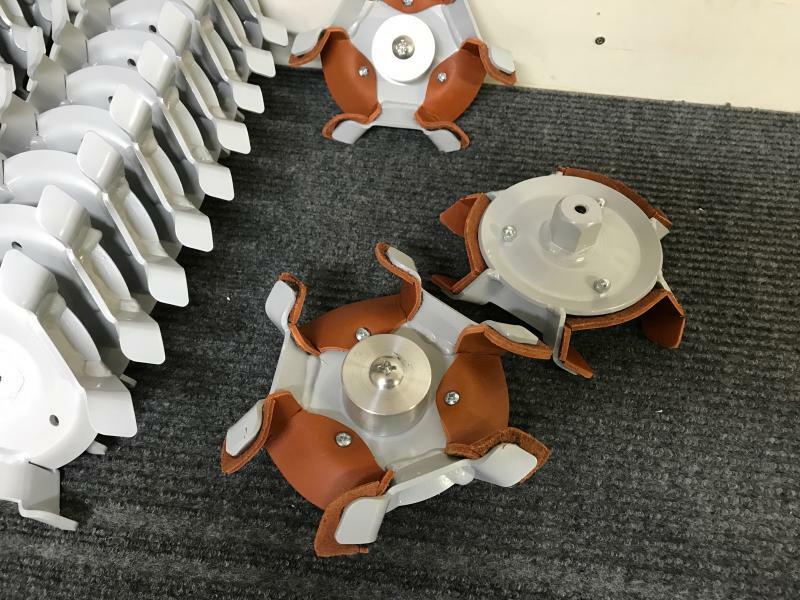 I have been told, a hammer beating on one ear at a time, distorts the spinner making it harder to remove.﻿Blocking the wheels will stop the wheel from spinning under torque.﻿﻿ The manufacturer's suggested method of securing spinners. It is a guess of how much torque has been beat on the spinners. ﻿Trying to remove over tighten spinners, in this high risk method, seems to be one of the biggest complaints. With an occasional replacement of a lead hammer.﻿ An 18 inch breaker bar and a 7 foot extension pipe was used to finally loosen an over tighten Cobra spinner that had one of the ears broken off but by using my knockoff tool with about 1,200 lbs of torque removed the spinner. ﻿This is the new Kit for the Cobras and the GT40s and others that use the Halibrand type spinners. Halibrand Spinner ToolA breaker bar or better yet, use a torque wrench for proper tighness and know they are not over tighten. Remember to safty wire for additional secutity. If your Halibrand spinner looks like this one, the tool will fit. This tool applies equal force to all 3 ears of the spinner without distorting the spinner. The tool drops onto the spinner and is protected with leather from metal to metal contact. For that vintage look, I used Old English Saddle Leather, tanned the old fashion way for durability and toughness.﻿ The leather can take the torque and is easily replaced. By adding an extension to the socket, the tool can reach into the deepest of wheels where a hammer should not go. If the hub threads protrudes more than 5/8 of an inch past a fully tighten hollow Halibrand spinner, It pushes the tool off its power portion and will bend the tips and will not work. on that wheel. Two reasons for this to occur, the hubs are manufactured longer or the wheels are made thinner. Only about 2% of the wheels or hubs cause the tool not to fit properly. Before ordering measure the hub for a 5/8 maximum measurement past a fully tighten spinner. You will need to remove the dust cap from the hub to use the tool unless it does not measure more than 5/8 inch. 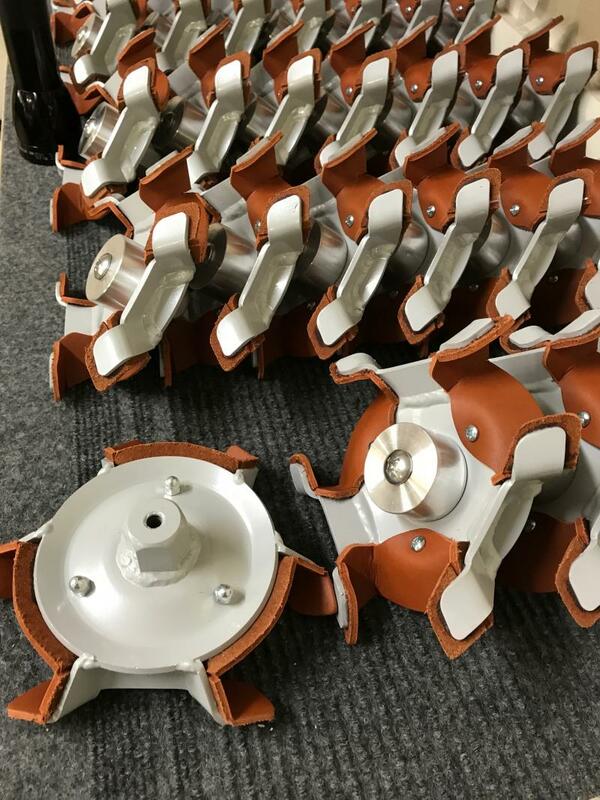 The center part of the tool can be unbolted and removed without any loss of function but does aid in attaching/stabling the tool to the spinner. If the ID of the hub is too thick to insert the metal center piece of the knockoff tool, the center piece of the tool can be removed and is still fully functional. With a torque wrench you'll know that the wheels are on with the proper tightness and safely secured without beating on them with a hammer. There is a tendency to over tighten the spinners, making it very hard to remove. The manufacturer's suggested method of securing spinners. It is a guess of how much torque has been beat on the spinners. ﻿Trying to remove over tighten spinners, in this high risk method, seems to be one of the biggest complaints. With an occasional replacement of a lead hammer.﻿ An 18 inch breaker bar and a 7 foot extension pipe was used to finally loosen an over tighten Cobra spinner that had one of the ears broken off but by using my knockoff tool with about 1,200 lbs of torque removed the spinner. This is the new Kit for the Cobras and the GT40s and others that use the Halibrand type spinners. 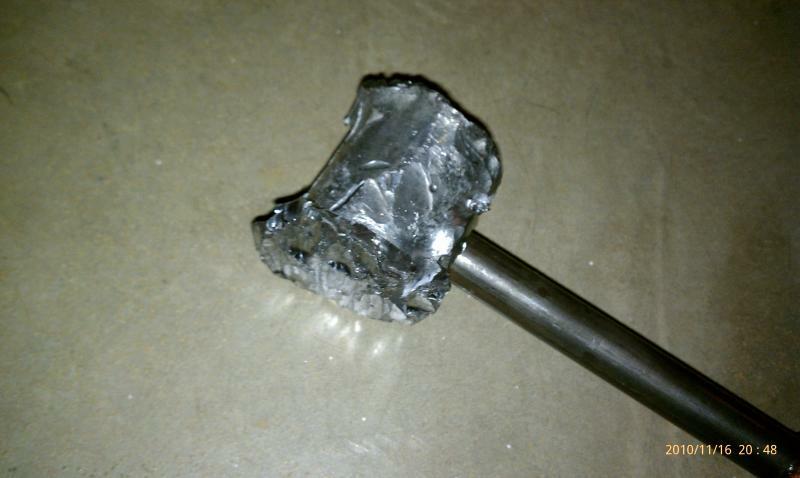 A breaker bar or better yet, use a torque wrench for proper tighness and know they are not over tighten. Remember to safty wire for additional secutity.